Every day, hundreds of thousands of Britons put their coffee cups into a recycling bin without realising they cannot be recycled unless segregated in bins just for cups. But two Cass alumni have come up with an innovative way to tackle the 2.5bn coffee cups that go unrecycled every year. 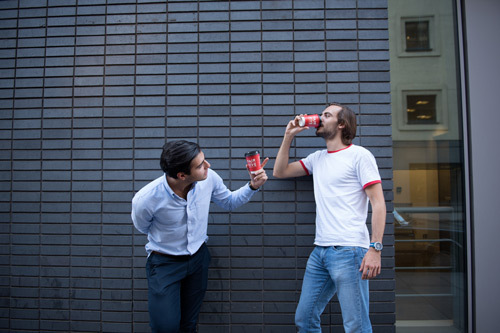 François de Vinols and Kourosh Madani, are launching a company called CupTheMarket, designed to fund coffee cup recycling through the use of advertising. CupTheMarket have teamed up with Action for Children to promote the charity's Fair by Five campaign. They will be unveiling their new cups at Cass Business School and showcasing their plan to use coffee cups as an opportunity for businesses and organisations to market themselves at independent coffee outlets and London universities, where millions of coffee cups are wasted every year. “CupTheMarket aims to convert that free advertising space available on cups into an incredibly efficient marketing medium which will in turn generate revenues to finance cup recycling. The adverts on our cups will be fun and will matter to our customers. François and Kourosh studied BSc in Investment & Financial Risk Management at Cass and graduated in 2013.